No Auto-Tunes, Crazy Great! THE VOICE Contestants Perform For Families! It was a time for togetherness as “The Voice” contestants went back home to visit their families this week. Their families made the trip out to Los Angeles to watch their beloved perform on stage during the live show tonight. 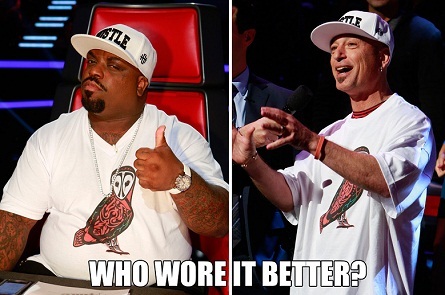 Cee Lo Green and Howie Mandel had some fun as a cross promotion of the premiere of new NBC game show which aired after “The Voice” called “Take It All” – who wore it better? 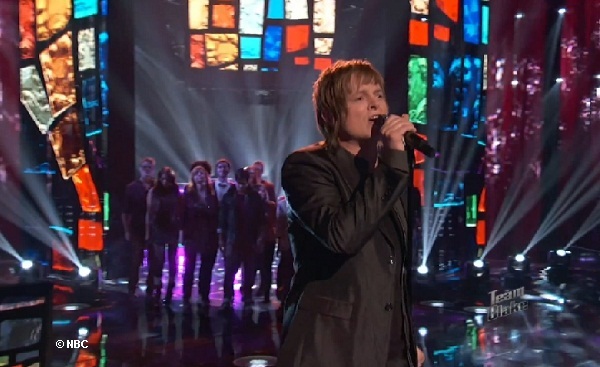 “Take It All” (pictured right) premiered after “The Voice” (left). Singing a song dedicated to all the kids at Luthronian Middle School, Trevin sang “Wind Beneath My Winds” by Bette Midler. He was backed by violin instrumentals with live players on stage. Trevin gave another stellar performance this week. He sang “You Are So Beautiful” by Joe Cocker. Nicholas dedicated this song to his family who were seated in the audience. Christina – “Cassadee you know that I’m a fan. Sometimes your voice sounds so right on that you almost sound auto-tuned because it’s so perfect and you’re on point. And it’s something that kind of blows me away about you. Terry was the last performance of the night. Terry sang a perfect rendition of “The Beatles” Paul McCarthy song “Let It Be.” He had the help of a gospel choir to sing background vocals. Terry’s wife and son were in the audience to support him. Blake – “That song -that’s sacred ground. There’s only a hand full of singers in the world that should attempt that and you’re one of them. None of us will ever be able to scientifically decide what musical perfection is. Watch the “Top 4 Live Performances” full episode aired Monday, December 10, 2012 ENJOY!